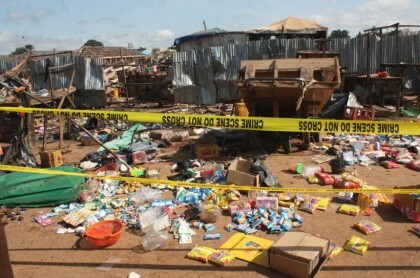 The Nigeria Police on Tuesday in Abuja said it had arrested two suspects in connection with the Oct. 2 bombings in Nyanya and Kuje, FCT. It would be recalled that 20 persons died and 21 others were injured in the blasts in the two satellite towns. The Inspector-General of Police (I-G), Mr Solomon Arase, who confirmed the arrest at the Conference of Senior Police Officers, said that the suspects aged 25 and 27 were from Kogi. He said that the arrest had foiled an attempt by the suspects to undertake another attack in the FCT. Arase said that 12 already prepared and prime Home Made Explosives (HME) concealed in 12 Farouk soft drinks cans and 28 pieces of electric detonators were recovered from the suspects. “The suspects are aiding detailed police investigations into their broad terror network and will be brought to deserve justice,”he said. The I-G assured that the police would continue to deploy its potentials to ensure public safety that could be attained by the cooperation of the public. He urged the media to continue to support the police in order to attain the national crime and security vision of the present administration. Arase, who also confirmed the arrest of five suspects of the eight-man gang who kidnapped Chief Olu Falae, said they were arrested at their hideouts in Niger, Ekiti and Ondo states. The I-G said that items recovered from them included the Bajaj motorcycle used to transport the victim and N823,000 part of the ransom allegedly received. He said that the suspects had been taken to Akure were they were being charged to court. It would be recalled also that the Department of State Service (DSS) had on Oct. 12 presented two suspects connected with the kidnapping of Chief Falae to the media. Arase said that the conference was aimed at strengthening the force and reviewing its strategy toward sharpening the ability of strategic police officers in discharging their mandates.